Most humans, especially the females, have passion for a perfect and glowing skin. No matter who you are, a student, a worker, or a homemaker, it is highly important to possess a good skin. Skin that looks youthful have a positive impact on your confidence level, hence, there is no doubt that it (your skin) needs to be taken care of properly. Factors That Prevent Glowing Skin? As the modern life is filled with daily stress, there exist a great number of factors that results in poor-quality skin. They range from bad habits, such as lack of skin care routine, poor diet, excess exposure to UV rays, sleep deprivation, smoking or alcohol to environmental elements, including air pollution. You should also take a note that avoiding to take proper care of skin is one of the major causes of many common skin problems like blackheads, whiteheads, acne, or blemishes. Lemon is widely known as one of the most impressive home remedies that helps in repairing your skin. Thanks to its citric acid, lemon is beneficial for keeping your skin clear by flushing out dead cells. Also, vitamin C in lemon can get rid of dark spots by raising the cell renewal process. Apart from that, this healthy home remedy helps boost the general skin complexion due to its bleaching agents. Oatmeal is used as face pack to help remove impurities, thereby stimulating cell growth, some studies say. Whether your skin is dry, oily or sensitive, oatmeal still works successfully for any skin type and generates positive results. You should always remember the potency of honey whenever you are experiencing a bad skin condition. The reason is that honey can serve as a perfect moisturizer and possess antibacterial qualities which assist in preventing further skin infection. All you need to do is to apply some quantity of honey to your skin, allow it to dry and then wash it off with warm water. The water in honey makes your skin stay deeply moisturized. You should try to perform the treatment process once daily. When it comes to any skin problem, Aloe Vera is strongly recommended since it gives many health benefits for the skin. Aloe Vera is loaded with antibacterial properties that can help eliminate bacteria leading which causes acne. Also, anti-inflammatory agents are good for soothing irritated skin. Astringent content helps ward off and conceal scars. When using Aloe Vera, your skin gets moisturized because of the development of new skin cell. If those above-mentioned natural remedies have not resulted in any improvement for your skin, coconut oil is another perfect choice because of its safe and natural compounds. Since it is a rich source of antioxidants, coconut oil can effectively combat with free radical action that partly contributes to dead and dry skin. Plus, coconut oil helps soften and moisturize your skin as it penetrates into some important tissues of skin deeply. · Avoid getting direct exposure to the sun. You need to take hat, umbrella, sunscreen or necessary clothing with you whenever you want to go out. · Avoid using cosmetics excessively since it makes your skin burn and irritating. Read the manual before using any of them. It is good to apply only products that contains natural elements. · Consume more fruits as well as vegetables that have a high level of essential minerals and vitamins. Vitamins such as E, C, or A plays an important role in regulating your skin and preventing from melanin. Carrots, papaya or tomato contain mostly those vitamins. 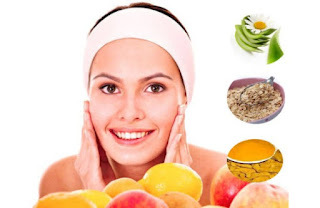 Now you have seen some effective natural remedies for glowing skin, it is your turn to make use of one or any of them. If you find this post interesting, kindly share this piece with your friends on various social media by simple using he share icons below.